In 1975, Arthur C. Clark, one of the most prolific science fiction writers of the time, predicted that by the year 2000, "Cars without wheels will float on air, bringing about the passing of the wheel." While Ford can't claim to be working on flying cars, it announced at its Further with Ford event, held at its research and development facility in Silicon Valley last week, that it's given some serious thought to how we'll get around in the next century, including self-driving cars. It's big solution? Something called multi-modal transportation that will be used in tandem with something more familiar: ride-sharing. Ford, always the pragmatist, argues cities of the future are going to be incredibly dense. So dense that streets may not be the primary avenue to get around, causing commuters to park miles away from where they work. This is where multi-modal transportation fits in. Ford imagines you driving your Ford electric car to a cheap, easily accessible location that would allow you to park there for the whole day. You'll then open up the trunk to pull out an electric bike to continue the trip into work, essentially breaking up your daily commute into two different modes of transportation. Ford has committed to the plan by developing three of these "eBikes" that vary in size and ridiculousness. The latest is called the MoDe: Flex and offers an interchangeable chassis that breaks apart in the center for storage and customization. The smallest of the bunch, which looks like the bicycles clowns ride around at the circus, is called the MoDe: Me and fits, surprisingly, in the trunk of a Ford Focus, one of the smallest coups in Ford's fleet. A lot of the eBike's potential lies within the iOS and Android apps that pair with users' smartphones. With the app, you'll be able check the weather weather, congestion, evaluate parking costs, check how long they can park in specific locations, traffic and the schedules for nearby public transportation. Ford wants it to be the epicenter for eyes-free navigation, route planning, and health and fitness information. Pairing a smart bike with a traditional form of transportation like a car, bus or train not only allows people to go further than usual, but gives them a small workout before work. 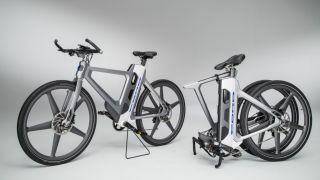 But while eBikes could take some time to take off, Ford is implementing another strategy to help its owners get from point A to point B while making some extra income. Following in the footsteps of ZipCar and Uber, Ford is partnering with two car rental services, Getaround in the US and easyCar Club in the UK. The new car-sharing program, called GoDrive, will have 14,000 customers in the US and 12,000 in London sign up for the chance to rent their Ford Credit-financed vehicles to pre-approved customers for short-term use and is taking new applicants right now. All potential renters would need to do is stroll up to your car while you're at work, take it out for a few errands and then return it with a full tank of gas to where they got it. For every hour their car is in use, owners will net somewhere between $7-$14 (around £3-£7) per hour. So why does Ford want you to share your car instead of having everyone buy one of their own? The answer lies with Millennials. Ford's research shows that more than half the people surveyed in this age demographic (born between 1982 and 2004) would be interested in renting out their wheels for some extra income, with the young folks saying that ride-sharing ranks second only to book lending as things they are most open to sharing. Just what exactly Ford gets out of the arrangement isn't clear (though I imagine it's some sort of kickback for every ride using a Ford vehicle), but for consumers trying to stay one step ahead of their next car payment, it sounds like a win-win. OK, so we're not quite where Doc Brown thought we would be in 2015, but there's been a fair bit of progress since Back to the Future's release in 1985. GPS systems, digital dashboards, the popularization of electric cars and self-driving cars have all been made in that time, and while Ford's initiatives aren't quite to the level of flying car, it's giving real thought to a future where not everyone needs a car.